A multi-site Canadian nursing research team based at the University of New Brunswick, Cape Breton University, and British Columbia Institute of Technology is investigating the use of several of Unbound Medicine’s information software programs known as Nursing Central™ and uCentral™. These downloadable mobile apps provide access to several quick reference resources. The purpose of this research project is to evaluate nursing students’ and educators’ use, and attitudes, toward mobile device technologies and Unbound Medicine’s software programs. Nursing students and faculty were surveyed from three Canadian nursing programs from six different sites where Unbound Medicine products are beingused to support teaching and learning. Unbound Medicine, in addition to powering the software apps and website, provided the research team with an iPad Mini as a potential prize for those surveyed. 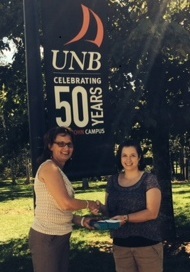 Laura Sullivan, a second year Bachelor of Nursing student at UNB Saint John, was selected as the winner of the iPad.